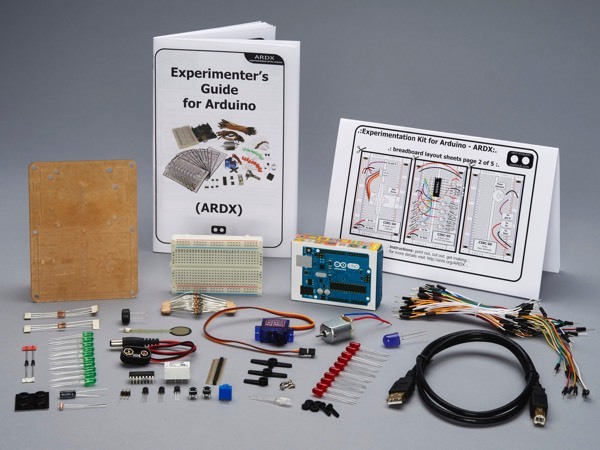 A kit including all the pieces needed to complete 11 different circuits, along with an experimenter's guide booklet & breadboard layout sheets. See http://www.oomlout.com/a/products/ardx/ for more details including hardware specifications and downloadable software routines. 11 circuits to explore micro-controller basics. Covering LEDs, transistors, motors, integrated circuits, pushbuttons, variable resistors, photo resistors, temperature sensors & relays. Comes with an Arduino Uno prototyping bundle to make constructing your circuits and future projects easy. Printed copy of the Arduino Experimenter's Guide means no need to flip between on-screen windows.